I’ve been meaning to write Stephanie’s story (and now Jack’s story) for a long time. It just seemed like such a monumental task. The recent death of a very special baby boy with D2HGA has inspired me to sit down and write our story. Some people think sick children are “less”, not the perfect healthy child everybody prays for when they are pregnant. Our D2HGA kids and other sick kids are so much “more”; they are special, and selfless. They don’t judge, they don’t hurt others, they don’t want more than we can give, they teach us to appreciate the simple things. Trust me, I have 2 other “typical” children so I know how self centered a child can be! They are better, beyond that – a gift! ​Our Daughter, Stephanie, was born on May 4, 1999. It was the day after our 3rd wedding anniversary and I couldn’t believe I had a girl! I felt so lucky. I had a son, Ben, who was born in 1997; he was almost 2 years old. What a perfect family! I always felt Stephanie was special; it was intuitive. I wondered why I felt that way, I had to appreciate every moment; I thought it was because she was a girl, what I always wanted. Stephanie had jaundice when she was born, it was not a large amount and she never had to go under “the lights”. I remember this because she slept a lot, and we couldn’t get her to open her eyes for the hospital baby picture. When I finally got the pictures in the mail, there was a poem about a sleeping beauty and how she wouldn’t open her eyes for the photo. I thought it was strange her jaundice didn’t go away until she was 5 weeks old; she had so little of it to start with. Stephanie had normal baby illnesses, colds and such. Our son was very healthy and never sick, so this was all new to me. When she was 8 months old she was baptized, during that time she was suffering from a fever for well over a week. During her baptism the fever went away, just for that morning, I felt God had His hand in this. It turned out she had a urinary tract infection. I had brought her to the doctor a few times, but the locum (our doctor was away) just gave me the same old story about “it happens with some babies, don’t worry”. Finally when our doctor came back, he ordered a urine test for infection, it was positive! She suffered for 2 weeks with fever and pain for the stupidity of a locum doctor! I felt bad too, since I’m a laboratory technologist and should have asked for urinalysis. When Stephanie was 2, she seemed to “stop” her progress with speech. Ben was very gifted and was reading by the age of 3 so we just thought we were comparing to him and really she wouldn’t develop as quickly as he did. At 3 Stephanie went to preschool, she still wasn’t toilet trained. I remember those phone calls where I’d have to go change her & take her home for doing “a poop” in her diaper. Nobody else’s child was wearing diapers. I was disappointed with her. In the second half of preschool, as Stephanie was approaching her 4th birthday, she still wasn’t talking more than a few words. Speech therapy was suggested to us and we went. From there we were referred to the paediatrican who ordered many tests on Stephanie and said “this looks like low IQ”. I remember those words like they were yesterday. Stephanie was also suffering from various infections ranging from strep throat to a possible blood infection; - she seemed to always be sick. I got a call from the paediatrician in May, just before we left on an Alaska cruise, - Stephanie had just turned 4. She said there was something wrong with Stephanie’s chromosomes. It turns out she has an inversion of chromosome # 12 on the “p” arm. I took a picture of her in the yard that day, so I would remember the exact time we found out there was something wrong with Stephanie. I can’t look at that picture without crying. 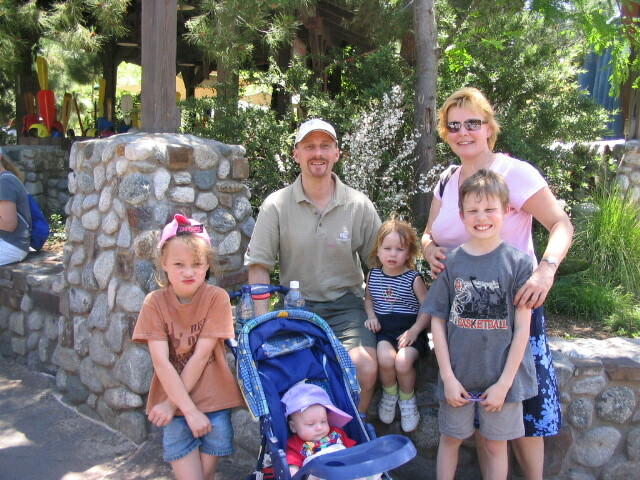 Later I found out I too have the same inversion, as does Jack and Martina (one of our healthy children). Whether this inversion has anything to do with D2HGA or if Stephanie has more going on there than we do, is yet to be determined. I thought that was all that was wrong & started researching everything about chromosome #12. A few days after we got back from our holiday I went to see the paediatrician. There was this other thing, an increased 2 hydroxyglutaric acid in her urine, but they’d have to send it off to Amsterdam in Holland for further testing to see if she had the D type or L type. The Paediatrician seemed not too concerned about it. It came back weeks later that Stephanie had D-2- hydroxyglutaric aciduria. They told me it was very rare, and at that time there were about 40 known cases worldwide, even now there are less than 100 known cases. There is no known treatment or no cure, such heavy words to hear. How was it that I was able to meet and marry a man who is a carrier of the same, unknown, defective gene? I can’t even imagine the odds of that! Soon after this all the appointments started. Stephanie also started taking CoEnzyme Q10, since starting it she is rarely sick and I feel it has really helped boost her immune system as well as helping minimize the effect of D2HGA. She also had to have baselines for all her organ systems so we could monitor the changes over time due to degeneration. It was such a tragedy for me to know everyday she will be a bit worse, that today she is healthier than tomorrow. As a mother it’s a hard thing to take. During this time, and still today, I have become so frustrated with the doctors and specialists. I’ve always been one to want to know Stephanie’s test results as soon as they’re ready; it’s probably the “lab tech” in me. I felt the doctors were unwilling to share those results, they treated me like “I didn’t need to know that”, when, in fact, I did. It would ease my mind to know what was going on with her, I could understand what was going on in her body and most of all it would help me to prepare questions for my next visit. There was one “glowing” exception, our geneticist, I could email her and ask questions, my need for results and information was understood. If not for this doctor I don’t know how I would have managed. In June of 2004 we had another baby, a girl we named Martina. I was so afraid she would have D2HGA, but she didn’t. I was so happy to have her; she was my 3rd child. Stephanie, unlike other 5 year olds, was not interested in the baby at all. She didn’t want to help, or look at her. I had to force her to be in a photo with her. I was accustomed to her “D2” ways and accepted this. We had just had her psychological assessment done and her IQ was borderline for mental retardation. In some parts she was at a 1 year old level and she was 5 years old. Stephanie started kindergarten in a private Christian school in the fall of 2004. I remember my biggest fear was she would “run away” during playground time, she had no sense of danger. She would go with anyone, and she had no fear. I remember I lost her in the supermarket one time, I was frantic and very scared; when I found her she was very calm in the “bulk food” section eating from the bins. She could care less that her mommy was missing. In spring of 2005 Stephanie was diagnosed with ASD, (autism spectrum disorder). This explained a lot about her, why she always played by herself, why she wasn’t ticklish, why she put everything in her mouth, why she would twist her arms and run way when people spoke to her, and so much more. Since then I have learned so many children with metabolic and mitochondrial disorders have autism (the defective enzyme for D2HGA functions in the mitochondria). I think every child with autism should be tested for those diseases. The diagnosis of autism also allowed for more funding and “help” for Stephanie in grade one, the following fall. In spring of 2006 we went on a trip to Maui, Hawaii. It was a great family vacation and Stephanie acted almost “normal”. We had so much fun, but I was sick for the last week of vacation. I soon found out why, I was pregnant again. I remember feeling embarrassed & not wanting to tell anyone, we had “dodged the D2 bullet” once before and this was pushing our luck. I didn’t even tell my husband until a month later. I waited to go to the doctor and when I finally did I got a lecture about having my 4th cesarean section; that was not what I was worried about. I felt so bad about being pregnant. I was 40 years old, what was I doing having another baby! I didn’t want to tell Stephanie’s doctors, but I had to in order to get the proper requisitions to test baby Jack for D2HGA, after he was born. At 14:44 on Jan. 3rd 2007 our “baby Jack” was born. It was my 4th c-section. I was up and walking 6 hours later. My husband couldn’t stay over night, so I knew I had to get up to look after Jack or they would take him away to the nursery. I wanted him beside me; he had been with me for so many months inside there was no way I’d let them take him away to the nursery! When he was 1 week old I collected his urine for organic the acids test that would determine if he had D2HGA. Those first 2 weeks with him were so special I will never forget them. It was before I found out he had D2HGA, that’s when it all changed. On a Thursday, when Jack had just turned 2 weeks old, there was a message on the answering machine to phone the geneticist. I was rushing to pick up Ben and Stephanie from school so I phoned her from the car on my drive to school. She told me “unfortunately Jack has increased 2-HGA.” I couldn’t believe it, my sweet baby Jack was sick too. I said something brave like I knew it was possible, but I was so sad inside. I phoned my husband and told him, he didn’t react nearly enough for my liking (but he’s one to keep feelings to himself) and I just felt so alone, so sad for my 2 “D2 kids”. When I told Stephanie, who liked her baby brother about as much as she liked Martina as a baby, she smiled and said “I’m not the only one”. I don’t think she knows what D2HGA is but she knew she was the only one in our family to have it, so now she wasn’t alone. Jack also had jaundice when he was born, he had such a small amount they didn’t even test him for it. He too took a very long time to clear the jaundice. He was yellow until 7 weeks old, and for starting out with such a low amount it seemed to take too long to clear from his body. He has most of his appointments ahead of him. He’s had many blood tests & I always feel bad for him when they hold him down and take his blood. He looks at me and cries. I can’t help him. It is now June of 2007 and Jack is doing well, he has “low tone” to some degree, and mildly delayed physically, but otherwise he is doing well. I don’t know yet, how he will be mentally. I am so afraid he will develop autism, a large percentage of D2HGA kids have it. I am trying to spend so much time appreciating his smiles and interactions with me, because they may slowly fade away, we are making memories. He sleeps with me every night, I want him close. I want him to love me for as long as he will before he too becomes autistic. Stephanie is finishing grade 2, she has “teacher’s assistants” one on one with her and she likes them. We have trouble with her schoolwork, and homework is torture for us. Many times we’ve thought “why bother sending her to school” but she goes. She loves her brother Ben more than us. I don’t understand why since he’s so bossy to her. She questions why people do things; she doesn’t understand why people are mean. I think we can learn from her. People have asked me “how do I do it?” They feel bad we have sick children, but I feel bad for them. It’s a whole different world we live in. I can’t even imagine if my biggest worry was whether my child failed a test or didn’t make the team. Stephanie and Jack have taught me to appreciate just that they live.